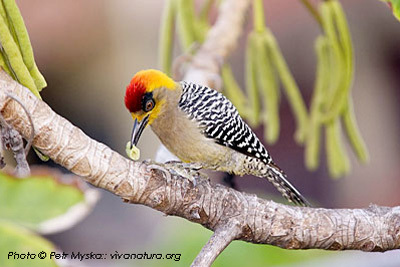 This species is certainly Vallarta’s most seen and busiest woodpecker. Although restricted to Mexican Pacific slope from Sinaloa to Oaxaca, it is quite abundant within its distribution range. In the bay area it can be observed easily in a variety of habitats, including tropical forest, mangroves and even suburbs rich in green areas. This bird is almost always seen in company of its couple. Both sexes are of similar size (19 – 22 cm) and both have upperparts barred in black and white. To distinguish in between sexes, I suggest focusing on the birds’ heads. While both male’s and female’s nape are yellow-orange, only male possesses a red crown. Male and female never seem to be too far apart and although they might be occasionally feeding on different trees, they almost constantly keep in touch through loud vocalization. Just like all members of the genus Centurus, this species feeds mainly on insects, especially larvae found under the bark and in the wood of trees. It is quite surprising that very little is known about this species’ reproduction, apart of the fact that, as can be expected from a woodpecker, the nests are built in hollow trees. 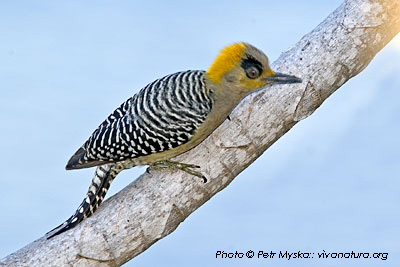 Golden-cheeked woodpeckers seem to be thriving in our region also thanks to the abundance of Cecropia trees, which with their hollow trunks offer these birds perfect nesting conditions.